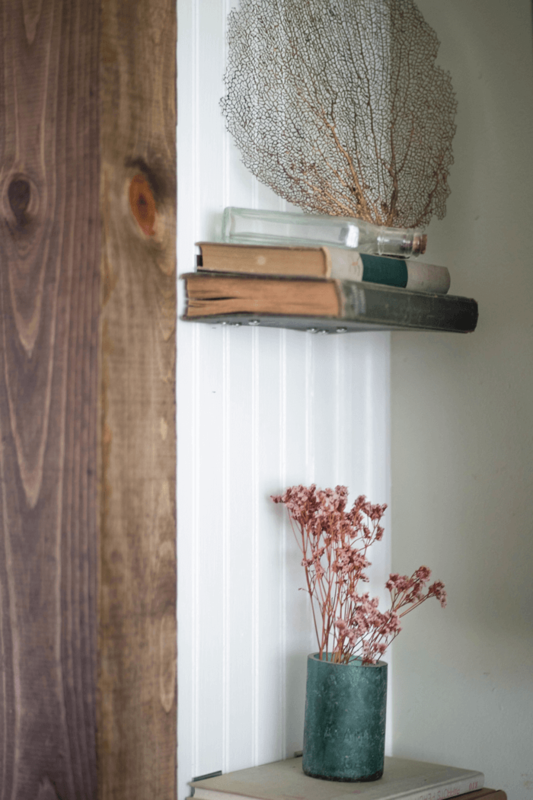 By Kayla DeVito / Styling by Old Grace Gathering Co.
A mason jar full of shell fossils and dried lavender add personality and an organic feel. The knife is actually a WWI bayonet. 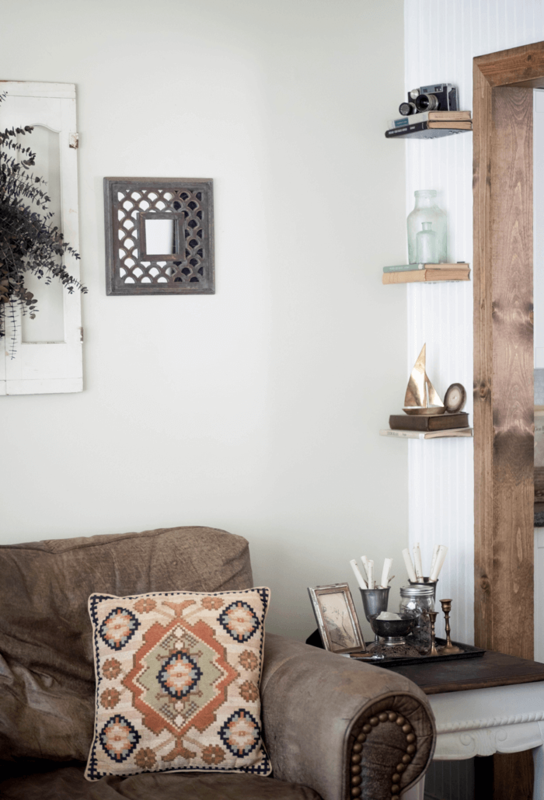 Step into any interior designer’s personal home and you will most certainly find yourself captivated by an array of mismatched treasures and perfectly posh collections arranged in vintage inspired vignettes. Why is it that the best spaces seem to have a touch of the unusual or fascinating? In an interior designer’s work, it is common to keep along the safe side of the thin line but once you step foot into their personal abode, art and creativity take over your senses. How do they do it so effortlessly? Hint: it’s not nearly as expensive or as cumbersome as you might think. In fact, decorating with personality is not a difficult task to endure in the slightest. It requires just a dash of planning with your mind, blended with a heaping spoonful of arrangement by the eye. Find objects that speak to you, that make you intrigued and proud. Search for items that cause you great joy each time you see them, no matter how long they have been perched on your shelf. This is the secret recipe not only to a beautiful interior, but also to an inviting home. Intelligent and well-planned design should always include attention to detail as the main ingredient. 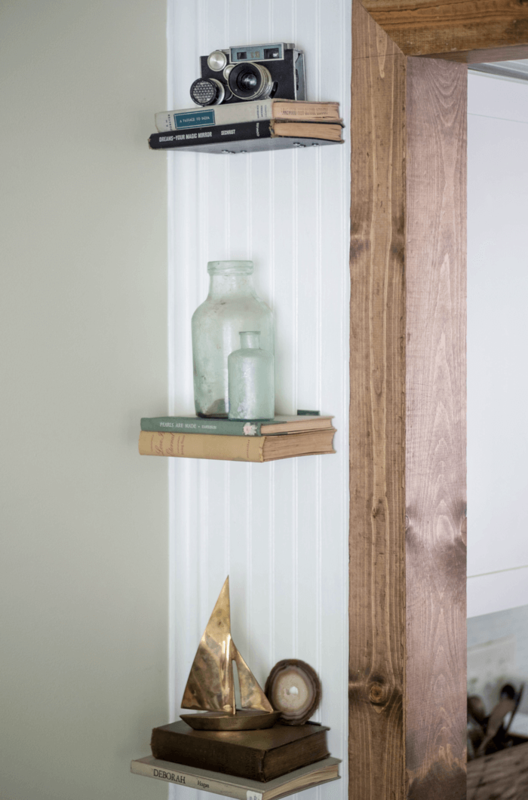 Adding accents to mundane and often over-looked nooks or surfaces can be the deciding factors in which way a room leans. Look around your space and notice the tops of tables and shelves. Do you like what you see? If the answer is no, fear not! Creative displays don’t have to cost a fortune and don’t require a 4-year design degree. More often than not, you probably have some beautiful items to display that you’ve never thought of before. Head up to the attic or down to the basement and take a look around with fresh eyes. A 1920s photograph, depicting a ship fighting a storm, is titled “Heavy Weather” and adds insight into a story amongst other items. I found a mason jar in my cabinet and added shell fossils my husband and I had found on our honeymoon and topped them with a few pieces of dried lavender. The silver-plated goblets were a gift from my husband’s aunt and uncle, who had used them at their own wedding 40 years ago. I rolled up old sheet music pages that belonged to my grandmother and placed them inside the goblets for height. My husband and I had also found a 1920s photo of a ship taking on water and titled “Heavy Weather.” We paid just $1 for it at an antique mall. I placed it in an empty frame I had for safekeeping. I love how the photo inspires curiosity anytime company comes to visit. The vintage brass candlestick holders echo the lamp base and add contrast. Lastly, I placed my treasured wood-handled WWI bayonet at the front of the tray. It may take a little arranging and re-arranging, but eventually you will find the perfect balance where your objects complement one another well. 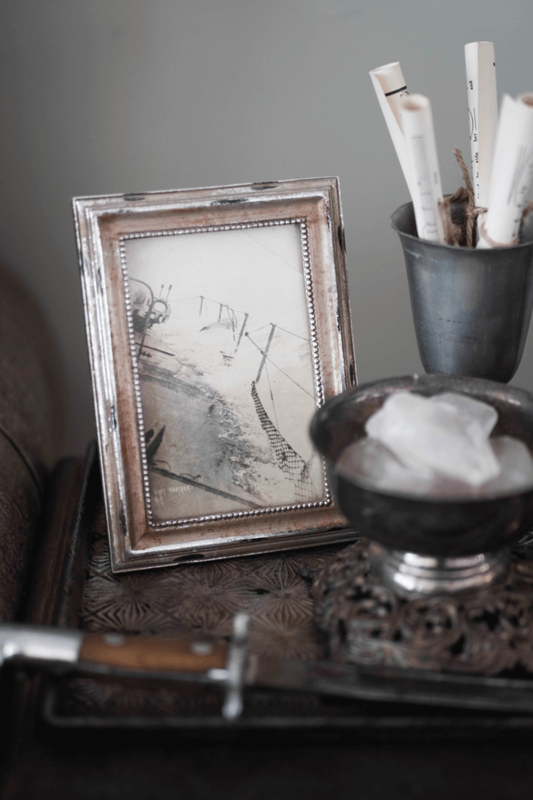 An old camera and a vintage brass sailboat both lend personal touches to a photographer’s home by the sea. Atop each “book” shelf sits memoirs of travels and my favorite thrifted finds: old cameras, a brass sailboat, antique aqua blue glass bottles filled with found seashells and dried flowers, an old wooden spool, even slices of agate that were found at a flea market. 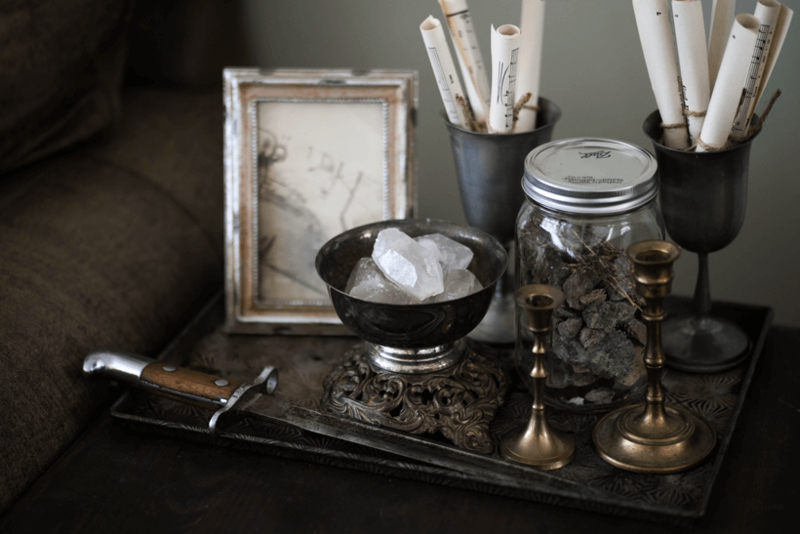 Mixing natural elements with a collection of old items can really add dimension and texture to your vintage inspired vignette, as well as add a much-needed break of pattern. Allow yourself to become inspired by a walk or a hike by searching for objects you can incorporate into your design. Smooth stones, shells, sea glass, driftwood, fresh or dried flowers, plants, geodes and fossils are all beautiful organic materials that can be collected with family members, making them even more meaningful in your space. Dried flowers and antique bottles adorn floating “book” shelves. When you begin to think of decorating your home as an extension of your memories, the journey of design itself becomes much less daunting and much more enjoyable. It does not require a heap of money or a wild creative imagination to design a gorgeous space. Bits and pieces of your life and travels, and attention to detail, are all you need for inspiration to begin filling your home. Kayla DeVito is writer, photographer and the owner of Old Grace Gathering Co., a company dedicated to giving back to the community. Together with her husband, Kayla also converted a vintage bus into a traveling jewelry store. Discover more on Facebook and Instagram.